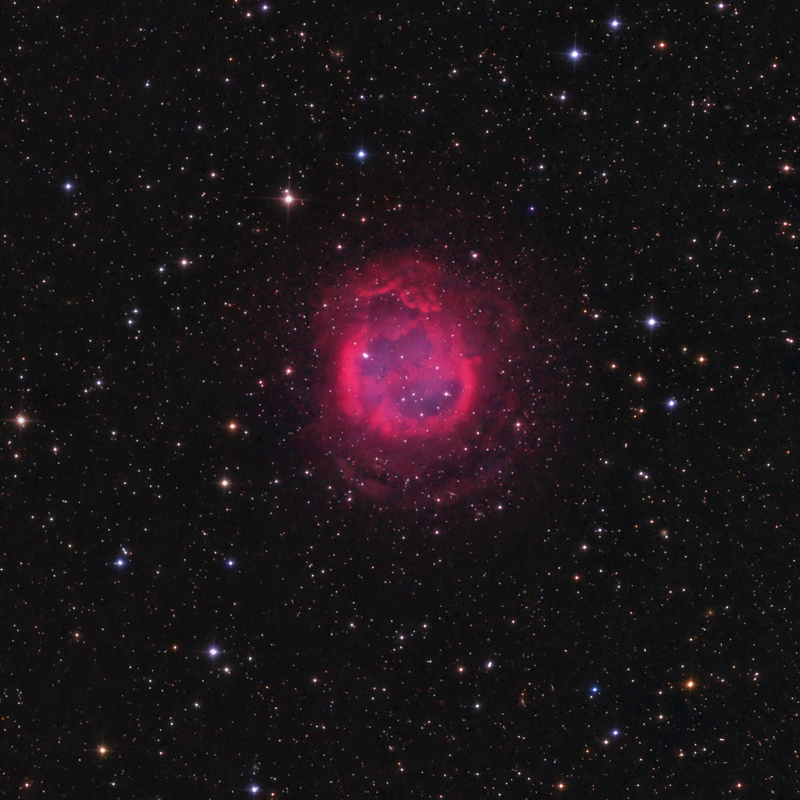 Abell 66 (PN G 019.8-23.7, ESO 595-4) is an old planetary nebula with low surface brightness about 1,800 light years distant in Sagittarius at RA 19hr 57m 32s and DEC -21d 36m 46s. It is about 2.2 light years across, assuming that distance. It is a challenging object to image, and as such, there are few amateur images of Abell 66. DSS plates illustrate the faintness of the object, showing a circular shape with a red rim from hydrogen (H-a) emission and a blue-green central region from oxygen (OIII) emission. There is a hint of additional H-a emission outside this circular region in the plates. Hua, Dopita and Martinis in “Detection of new emssion structures around planetary nebulae” in Astron. Astrophys. Suppl. Ser. 133, pp 361-380 (1998) show the northern halo structure from H-a, NII and OIII data taken with the 2.3 meter telescope at ATT in Siding Spring, Australia. Marquez-Lugo, Ramos-Larios, Guerrero and Vazquez in “On the relationship between the H2 emission and the physical structure of planetary nebulae” in MNRAS, 429, pp 973-986 (2013) show the EW central bar and radial structures in IR 8 micron H2 images. The above image may represent the first deep, color, amateur image of Abell 66 that shows it to be anything but featureless. This image size is about 23 x 23 arcminutes, north is up and east toward the left. It combines 11 hours of H-a and 10.5 hours of OIII data. The brighter circular central region is about 4.3 arcminutes in diameter with a strong H-a rim and bright OIII core, including some structure defined by the H-a emission. Furthermore, these deep data show an external halo. There is a brighter northern halo with considerable structure including some “finger-like” projections. There is additionally a looped structure toward the northwest. The southern halo appears to have several arcs following the circular shape of the central region. The halo extends the structure to about 7.3 arcminutes in diameter. 2.5 hours of RGB data were added for star colors. The final OIII and H-a images are presented below and have been inverted to better show the extended halos. Again, north is up. The 5 nm H-a includes any NII emission and has been labeled appropriately as H-a + [NII].